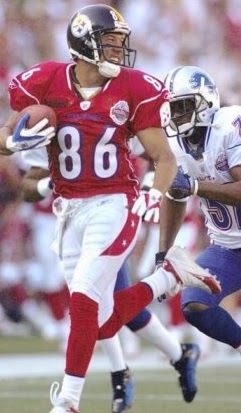 There was a sellout crowd of 50,225 at Aloha Stadium in Honolulu for the AFC-NFC Pro Bowl on February 13, 2005, marking the 26th consecutive season that the contest had been staged in Hawaii. The coaches of the teams were Pittsburgh’s Bill Cowher for the AFC and, for the NFC, Jim Mora Jr. of the Falcons. 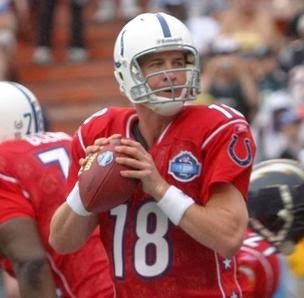 The AFC scored first on a 62-yard pass play from QB Peyton Manning (pictured above) to Indianapolis teammate WR Marvin Harrison. New England’s Adam Vinatieri added the extra point. LB Joey Porter of the Steelers then intercepted a pass by Eagles QB Donovan McNabb and Manning led the AFC on another scoring drive, going 69 yards in five plays and finishing with a throw to wide-open Pittsburgh WR Hines Ward for a 41-yard TD. With Vinatieri’s conversion, the score was 14-0 heading into the second quarter. The NFC put together a long scoring series of 10 plays that covered 84 yards and concluded with RB Brian Westbrook of the Eagles running for a 12-yard touchdown. David Akers, also of Philadelphia, added the extra point. However, when the NFC attempted an onside kick, Ward leaped to grab the ball and then ran 39 yards for a TD (pictured below) – the second on a kickoff return in Pro Bowl history (Detroit’s Jack Christiansen ran won 103 yards in 1956 at the time of the old East vs. West format). Vinatieri kicked the point after and the AFC was again in front by 14 points at 21-7. Buffalo LB Takeo Spikes intercepted a pass by QB Daunte Culpepper of the Vikings and, adding in a lateral to Porter, the AFC had the ball once again in NFC territory. They added more points, driving 38 yards in eight plays. Manning tossed his third TD pass of the game, connecting with TE Antonio Gates of the Chargers from 12 yards out. The NFC finally got on the board again before the end of the half, driving 65 yards in 10 plays. Akers kicked a 25-yard field goal with 1:45 left on the clock and the AFC took a 28-10 lead into halftime. The AFC defense was exceptionally aggressive during the first half, which led to grumblings by NFC players and coaches that they were blitzing – something not allowed in the Pro Bowl. Heading into the third quarter, Atlanta QB Michael Vick rallied the NFC on three straight scoring drives. In his first possession behind center, Vick completed four of six throws, including a 27-yard touchdown pass to WR Torry Holt of the Rams. It finished off an eight-play, 73-yard series and, with Akers adding the PAT, made the score 28-17. The next NFC series, following an interception by Philadelphia CB Lito Sheppard of a pass by QB Tom Brady of the champion Patriots, went 69 yards in nine plays. It concluded with the elusive Vick running three yards and diving into the end zone for a TD, despite his helmet being knocked off by Baltimore SS Ed Reed. The AFC came back to add points early in the fourth quarter as Vinatieri kicked a 36-yard field goal to finish a 13-play, 54-yard possession. However, the NFC responded by driving 68 yards in 12 plays and, midway through the fourth quarter, Akers kicked a 21-yard field goal to narrow the tally to 31-27. That was as far as the NFC got, however. On the next series, the AFC drove 71 yards in six plays to add to their lead. QB Drew Brees of the Chargers passed on a flea-flicker play to his San Diego teammate Gates for a 33-yard gain to set up a four-yard TD carry by yet another Charger, RB LaDainian Tomlinson. There was still plenty of time, but the AFC defense stopped the next NFC series in five plays and then finished things off when Buffalo CB Nate Clements picked off a Vick throw with two minutes remaining to play. The AFC came away with a 38-27 win. The NFC had more total yards (492 to 343) and first downs (26 to 15) but also committed three turnovers, to two by the AFC, as well as the TD on the botched onside kick. Peyton Manning was the game’s MVP after completing 6 passes in 10 attempts for 130 yards, with three for touchdowns. Tom Brady made good on just four of nine tosses for 48 yards and gave up an interception, while Drew Brees completed both of his passes for 58 yards. RB Rudi Johnson of the Bengals was the AFC’s top rusher with 33 yards on six carries. Hines Ward had three catches for 63 yards and a TD, as well as the kickoff return for a score, and San Diego TE Antonio Gates also had three receptions, for 51 yards and a touchdown. Thanks to the long scoring catch, Marvin Harrison accumulated 66 yards on his two pass receptions. For the NFC, Michael Vick completed 14 of 24 passes for 205 yards and a touchdown with one interception. Also rushing for 10 yards on three carries, he became the first quarterback to both throw and run for a touchdown in a Pro Bowl contest (although a running back, Marcus Allen, had done it in 1986). Daunte Culpepper was successful on 9 of 15 throws for 124 yards, with one intercepted, but Donovan McNabb was a disappointing one-of-eight for 24 yards and also had one pass picked off. RB Tiki Barber of the Giants ran the ball 9 times for 70 yards and Torry Holt pulled in 5 passes for 99 yards and a touchdown. “I’m not going to say I wasn’t holding my breath over there once Vick started to roll around, but our defense did a great job of stopping him,” said Manning, who was making his fifth Pro Bowl appearance. “It was good we got the game this year after we let the lead slip away last year.” He was referring to the wild 55-52 contest of the preceding year that was pulled out by the NFC. The win was the fourth in five games for the AFC and broke a tie to give them an 18 to 17 edge over the NFC since the Pro Bowl had adopted the AFC vs. NFC format following the 1970 season.